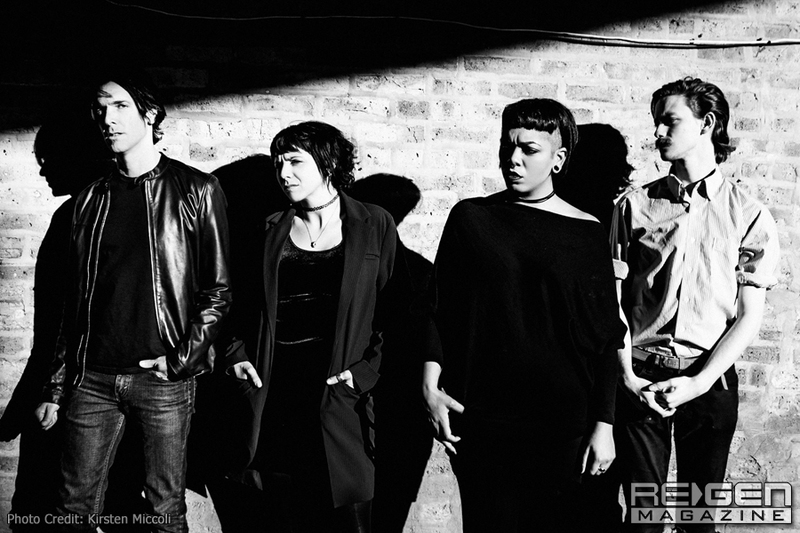 Named for a dissociative disorder and showcasing a dynamic and disparate sound that is as spastic and confrontational as it is saccharine and challenging, Chicago’s Ganser is a band to watch out for! 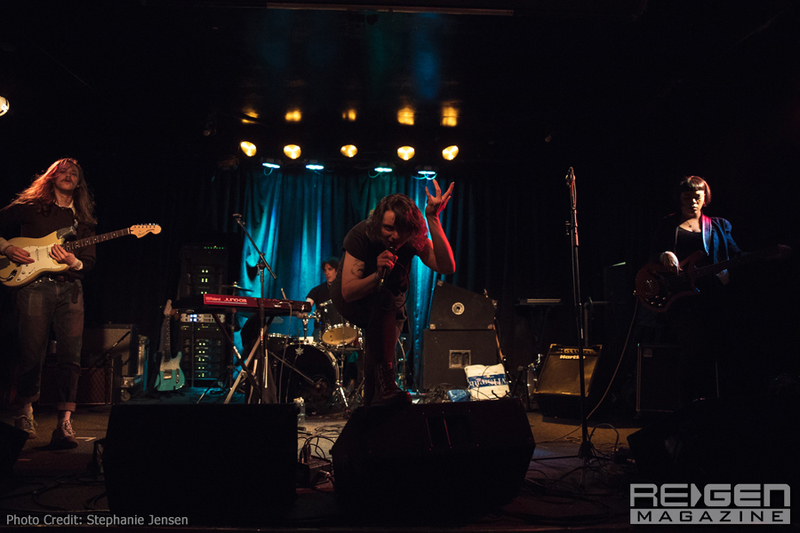 Forming in 2014 and named for a rare dissociative disorder characterized by mimicking psychosis, Ganser has been making the rounds in the band’s native Chicago and beyond. With this year’s release of the Odd Talk full-length album on No Trend Records and having embarked on a small tour of the U.S. East Coast, the quartet of Alicia Gaines, Brian Cundiff, Nadia Garofalo, and Charlie Landsman presents an intriguing clash of musical styles. Elements of post-punk, electronic, no wave, and indie rock blast through the speakers to challenge the listener’s sensibilities – it’s got the in-your-face energy of the most raucous punk show, juxtaposed by a sense of atmospheric chill akin to a jazzy noir soundtrack. It’s as if Sonic Youth were covering Lalo Schifrin, offset by an irreverent sense of humor. Appearing at this year’s ColdWaves in the Windy City, ReGen Magazine is privileged to have had the opportunity to speak with Alicia Gaines and Nadia Garofalo about the group’s creative trajectory, touching on the interplay among the four band members and the culling of disparate influences to craft a distinct and singular sound, proving that Ganser is a band sure to achieve greater heights of success. Let’s cover a bit of the band’s history – tell us about how the band came together? What were your initial creative goals for Ganser, and what are your thoughts on how the band has been progressing from there? Garofalo: It was a cold oppressive Chicago winter when Alicia and I decided we would either start a creative project or get lobotomies. It could have gone either way really. Gaines: Yes, the band started as a project to distract us from Chicago’s brutal winters. With each project, from single to EP to longer EP to album, I think our world and vocabulary is growing. Naming the band after a dissociative disorder came from our interests, but honestly, I think being a conduit for the strange offhand thoughts we have, the ineffable and inner world, the band name makes more and more sense with time. Eventually, we’ll just be babbling to ourselves in a corner. 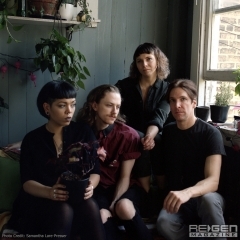 Ganser’s sound is a unique blend of styles – elements of punk and post-punk, electronic and darkwave, art work, and even some jazzy noir-like moments; what would you say are the band’s primary influences – both collectively and individually? Gaines: We have a cinematic sensibility, something we hope to develop further. Visuals are tied pretty strongly to songs for us, whether they’re snapshots or scenes. Musically, we’re a strange venn diagram, so usually, it’s one of us pulling at our collective interests towards say, Krautrock, until the rest of the band pulls them back into a place we can all live with. Our tour conversations range from the occult to John Waters to Werner Herzog to WWI history, so that also gets tossed in, our current fascinations. Regarding the songwriting process, are there any songs that stem primarily from one person, or is it all a collaborative band effort? Gaines: All of the songs are collaborative, save for our instrumental parentheses tracks, (like ‘Miscommunication’ on Odd Talk). Those tend to come from one person, and whether they feel like it or not, they feel very special in that way to us. Donnie Moore co-produced your latest album, Odd Talk. Can you tell us about the band’s relationship with him; how did his production style mesh with the band’s working dynamic up to that point? In what ways do you feel he strengthened the Ganser sound for the album vs. your past releases? Garofalo: Donnie (of the band Absolutely Not) was a treat to work with! He was so enthused about what we were doing and brought a great energy into the studio as well as some excellent ideas that could only come from an ‘outside the band’ perspective. Gaines: We would have exchanges in the studio that were more about color and lightness/darkness versus musical terminology; sometimes onomatopoetic ‘it should sound like this’ conversations where we all appeared crazy at times, I’m sure. 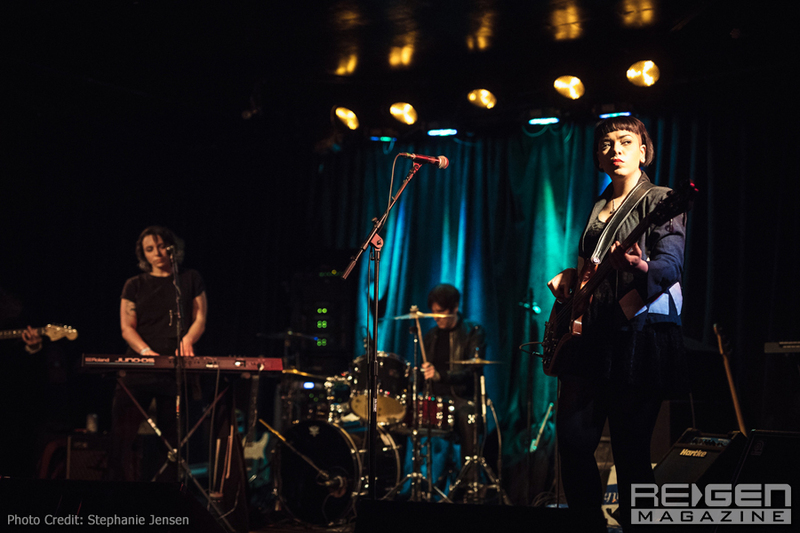 Seeing the band live, I was particularly taken with how everyone presented a different energy – Brian’s drumming being very fluid and powerful while he seemed to have this Zenlike calm about him; same with Alicia having a cool but reserved, almost stoic stance on the bass, while Nadia would shift from a calm demeanor on the keys to an almost manic state while singing. 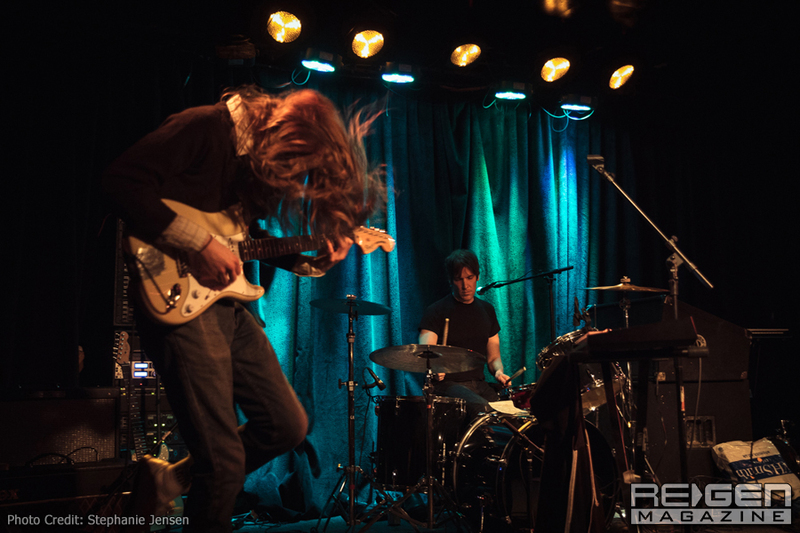 And particularly Charlie on the guitar; I couldn’t wrap my head around how he played so flawlessly while moving so spastically. Not really sure I have a question here other than to what extent the visual component of the live performance factors in; is it all just how you each perform, or are there plans to take things further in the future? Garofalo: For me, the live aspect is very important. It’s a cathartic performance of my emotions pouring into the music. I get to use my physical body to communicate on a level you just can’t on a recording. Gaines: We always want to do more. Visuals, projections, etc. are becoming more in our repertoire as we edit our own music videos (‘Avoidance,’ ‘Satsuma’). While most of your shows that I’m able to see are mainly in your hometown of Chicago, you recently embarked on a small tour. Tell us about that experience? What did you find to be the major challenges? Will you tour again, and if so, what do you think you’ll be improving or doing differently? Garofalo: The tour was overall a great experience, but being still a very D.I.Y. outfit can tend to put some stress on us when on the road – driving, planning where to stay, etc. In the future, we will probably look into having a manager to help alleviate some of the stress. 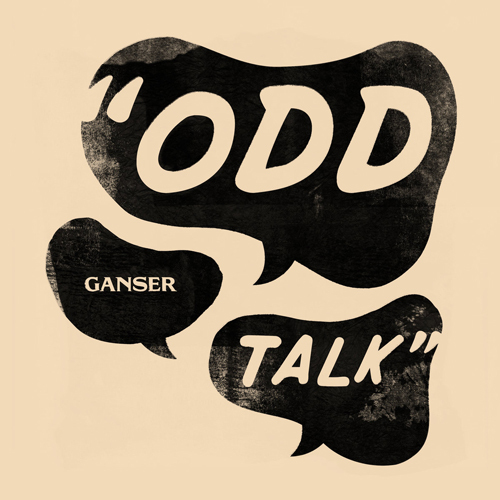 Odd Talk was released digitally and on vinyl and cassette; I’ve certainly understood the appeal of vinyl with regards to the packaging and artwork, but I’m still curious about cassettes and why they have resurfaced (beyond simple nostalgia). From your perspective, what is it about these older mediums that have led to their resurgence? Or more personally, what appeals to Ganser about them? Gaines: I would be surprised if most of the tapes are a token for a digital download. We’re okay with that. I think a lot of people also have beater cars that only play tapes. Personally, when designing the artwork, I like the idea of the cassette and vinyl being slightly different and explorable to a certain extent – an idea that came from pouring over CD booklets as a kid. Garofalo: It’s nice to have an artifact along with the digital music downloads, something tangible to take home and put on your shelf. Cassettes are a very accessible example of that, being both cheaper to make as an artist and buy as a consumer. 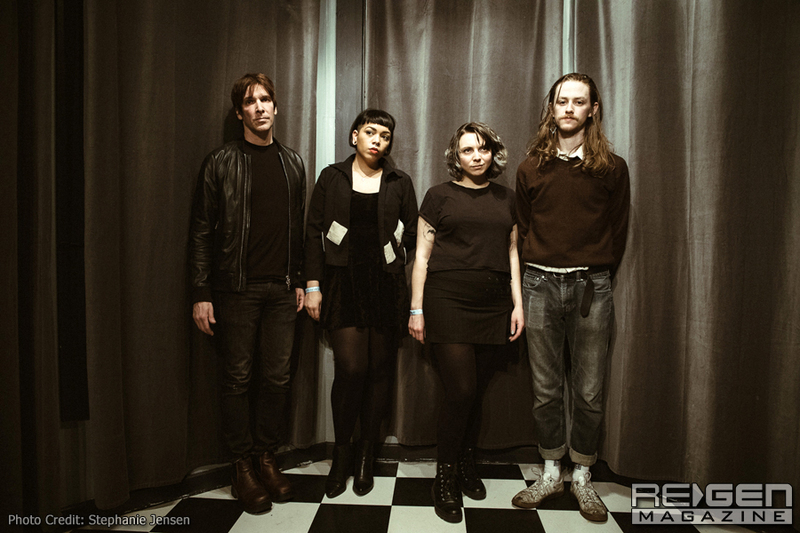 I first met Nadia when she joined Rabbit Junk at a ColdWaves kickoff event, and now Ganser is performing the third night at this year’s Chicago ColdWaves. What is it about ColdWaves that you personally connect with? Garofalo: Really, it’s Jason Novak taking an interest in us and bringing in more diverse styles of music to the festival. I personally have felt pretty disconnected from the industrial scene over the past few years for a multitude of reasons, so it’s good to see a festival taking an interest in expanding the idea of what that genre means and what it relates to. Not to get overly political, but there have been rising concerns about racism, sexism, nationalism, anti-LGBTQ, right wing attitudes all across the board, and this applies to art and music as well; they just seem to be coming out of the woodwork. From your perspective, what sort of solutions – short term or long term – do you think can be applied to combat these attitudes? Gaines: Insofar as how we operate, I hope it brings a sense of solidarity that we are making art in the bodies that we inhabit in this particularly strange time. Sometimes, the presence of someone swimming in the same water as you, processing it through art, that gives you the energy to keep moving forward. Garofalo: While we aren’t a political band, these issues obviously affect us both personally and generally being humans on the planet. It’s easy to feel pretty helpless when reading the news and comment sections. It’s important to remember that this stuff isn’t new; these issues have always been there. As creative people, we feel it’s important to continue to produce and have our perspectives put out into the world. Even if it isn’t political, it’s a voice and an experience that will hopefully connect with people and encourage them to not feel so alone in their experience. I think when we build communities through shared feelings and interests, we also build strength against the negativity. Gaines: We are currently writing our next album. Garofalo: Onward and upward! or maybe revisiting that lobotomy idea? It could still go either way at this point.